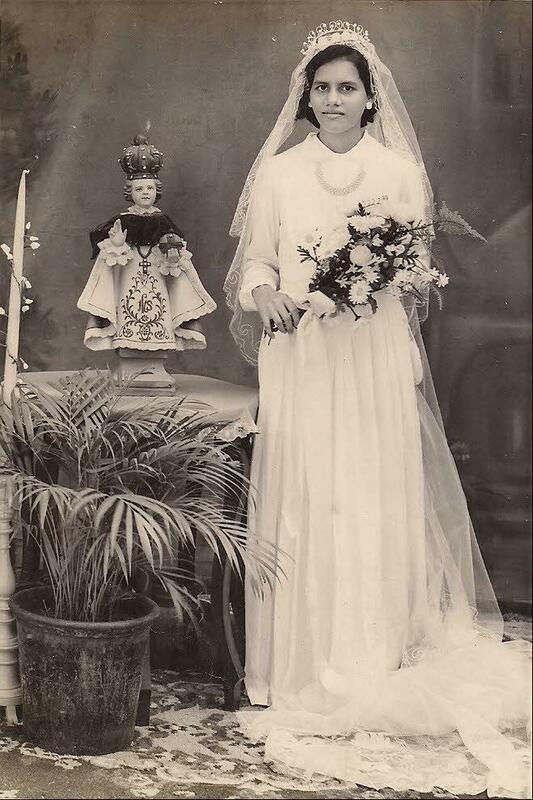 Sr. Mary Leonette was born on 28 June, 1940 at Moodubelle and was baptized on 4 July 1940, and named Leena Elizabeth Barboza. Her parents were late Salvador Barboza and late Mary Piadade D’Souza. Originally from Shirva, Salvador Barboza was brought to Moodubelle at a very young age of 15 years by Fr. Casmir Fernandes in 1910 who was commissioned to build a church there. Salvador Barboza carried out multifarious activities and responsibilities such as supervising the labourers, maintaining accounts, assisting the parish priest in teaching catechism, marriage preparation, attending funerals, liturgy singing and other odd jobs in the parish. Leena Elizabeth was the eighth child among eleven children, five sons and six daughters of Salvador and Mary Piadade. Although a large family, all children received much love and affection from their parents and were brought up in a religious atmosphere. The family prayer, recitation of the Rosary and daily Mass were never missed. After her higher primary education in the parish school Leena Elizabeth wished to continue her studies. But there was no high school then in Moodubelle. Her brothers, especially Boniface Barboza (Benny Master) had to walk a good distance of about seven miles daily to school far away in Shirva and completed their high school studies. Leena Elizabeth was not able to walk that distance as she wasphysicallyweakand used to fall sick often. Since her elder brother, Boniface by then got a job as teacher in the parish school family’s financial condition began to improve. Leena Elizabeth expressed with him her desire to continue her studies. She was sent to St. Cecily’s convent, Udupi, where she spent 4 years as a boarder and completed SSLC. It was there she came in contact with the sisters for the first time. The sisters were very kind and loving and she felt an attraction towards the religious life. The seed of vocation that her parents sowed in loving and prayerful and disciplined atmosphere at home grew. Though Leena Elizabeth had a desire to do college studies, circumstances at home were not favourable and hence she decided to do teachers training course and take up teaching as a profession and managed to get admission at the Training School at Gurpur run by the Bethany Sisters. From the first day of her stay there the sisters were constantly after her to join the congregation. However, Leena Elizabeth had a strong desire to join the Apostolic Carmel, although she had not expressed it to anyone. On completing her training course, Leena Elizabeth was disappointed not to have secured a job in the parish school at Moodubelle. Meanwhile, there was a vacancy at St. Cecily’s High School which she took up and taught for two years. Thereafter, Leena Elizabeth joined St. Agnes School, Mangalore. 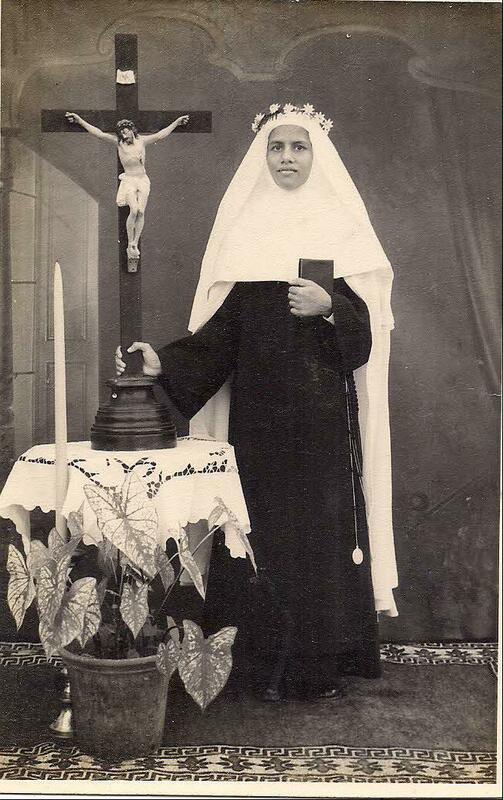 Being constantly in the company of sisters, the religious calling became deeper in the heart of Leena Elizabeth and at the age of 21 she expressed her desire to Mother Carmelita who was then the principal of St. Agnes College to join the Apostolic Camel. One her recommendation, Leena Elizabeth joined the congregation on 24 May 1963. 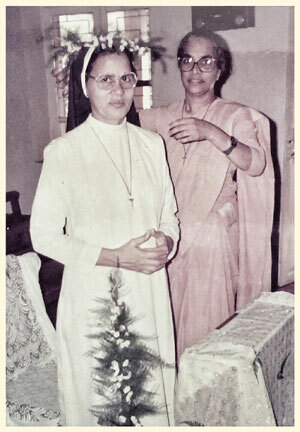 After the initial training in the novitiate, Leena Elizabeth took the name of Sr. Mary Leonette and 0n 3 May 1966 made her first Profession at the Rosario Cathedral, Mangalore. With School Staff at Quarter gate, Pune. The first assignment as part of the Juniorate of Sr. Mary Leonette was to St. Agnes Convent, a large community of 58. Two years later she was transferred to Stella Maris, Ullal, Kotekar to teach in the school and to look after orphans. But her stay at Kotekar was only for a short period of two weeks. Within two weeks, Sr. Mary Leonette was packed again from Ullal to Mary Hill and from there to Alnavar, a new mission station in Belgaum diocese. Though the place has been little known and backward, the people of Alnavar were very simple, uneducated, but very loving and generous towards the sisters. She spent one and a half year in their midst teaching catechism to adults, preparing children and adults for liturgy and Sacraments, visiting and catechizing in other mission stations far away in the Belgaum Diocese. The rest of the two years of her Juniorate were spent in St. Cecily’s Udupi followed by tertianship of 5 weeks duration at Jayanagar, Bangalore. Sr. Mary Leonette made her Final Profession at Mary Hill, Mangalore along with her my companions on 24 May 1971. Thereafter, she was transferred to St. Ann’s, a large community of 55 sister. After two years she was assigned to Western Province and was sent to St. Mary’s Convent, Mapusa. She did two years long diploma course in Sacred Sciences in the Institute Mater Dei – Santa Monica in Old Goa. Her next destination was Mt. Carmel Convent, Lullanagar, Pune. Daily she used to commute to school at Quartergate in the city for 6 years, leaving the house at 7 a.m. and returning at 6 p.m.
After successful assignments in Goa and Pune, Sr. Mary Leonette stayed for 7 years at Carmel Convent, Bandra being In–charge of the Primary School. During those years she gained a lot of confidence and knowledge interacting with the staff and parents who were very cooperative, trying innovative methods of teaching and so on. 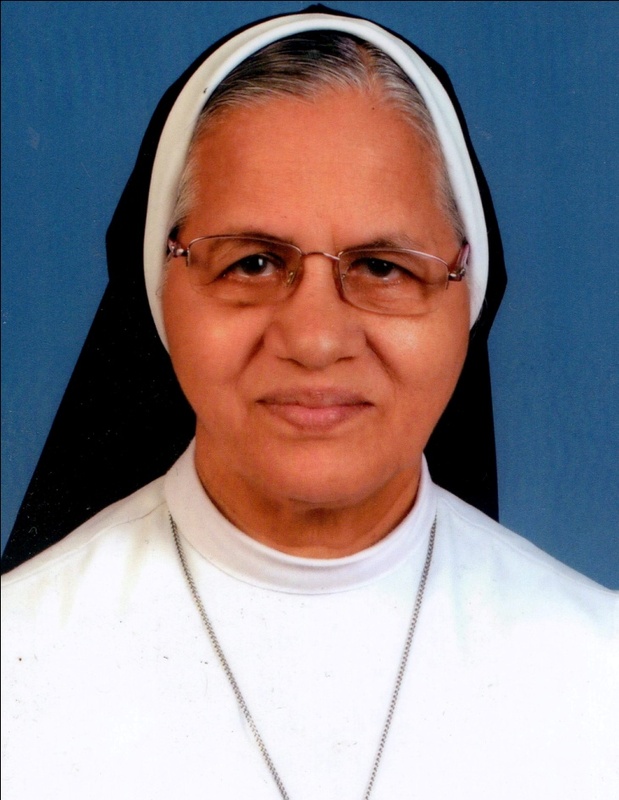 In 1989, Sr. Mary Leonette got a transfer to Holy Rosary Convent, Nuvem, Goa and was put in charge of boarding. Two years later on the day of the Silver Jubilee of her Profession, she received the assignment as Superior at Rosa Mystica Convent, Aldona for 3 years. The next 6 years were spent at St. Mary’s, Mapusa being in-charge of Primary School, Pre-primary School- both away from the convent, besides being In-charge of boarders. After a long period of service in different institutions run by Apostolic Carmel Congregation at various places, Sr. Mary Leonette officially retired in 2000 and left for the new foundation at Kalamboli, Navi Mumbai. From 2001 to 2003 she was Sister-in-charge at Carmel convent, Kalamboli and was transferred to Carmel Convent Ajni, Nagpur as Superior. In 2006 she was asked to take charge at ‘ Saranya ’, Bangalore, a centre for ongoing formation of sisters of her congregation. Sr. Mary Leonette had an opportunity to visit foreign countries such as Sri Lanka where she had a renewal programme. She also made a trip to the Netherlands (Holland) along with Sr. Elvira Tellis Nayak as her companion, sponsored by her friends, a Dutch couple Tiny and Piero whom she had met in Goa in 1998. It was the wish of Sr. Vincent, the Superior General that seven Kenyan junior sisters – students and four professed sisters of different provinces form a Community at Saranya. Once again, Sr. Mary Leonette was assigned the responsibility as Sister-in-charge. At the end of the three years at Saranya, she once again accepted the assignment as Superior for 3 years at Rosa Mystica Convent, Aldona for a second time. In 2012 Sr. Mary Leonette received a letter from the Superior General- appointing her as the Animator (Superior) of Carmel Convent, Kalamboli, Navi Mumbai for a term of 3 years. Nine years ago, she was sent there as a member of the pioneering community of four sisters to set up a school. After spending 3 years as Superior, Manager of the school and being In- charge of pre-primary school, she received transfer order to Lourdes Convent, Jayanagar, Bangalore. Having reached the age of 76, Sr. Mary Leonette has been growing old gracefully, yet trying to keep herself young in spirit to carry out her assignment being In- charge of the pre-primary school where she encounters daily the little ones- around 550 of them. Sr. Mary Leonette will be celebrating her Golden Jubilee of religious life on 5 May 2016 at 11 am with the thanksgiving mass in St. Lawrence Church, Moodubelle followed by reception. Hearty congratulations on Golden Jubilee of service as Carmelite Nun.Best wishes to all family members especially Benny master my teacher and James along whom feel proud to be family member sharing Sr Leonetts sacred achievements. Congratulations Aunty Leonette, I remembered you alot and prayed for you on this special day. I really missed coming personally, but you were in my thoughts and prayers. Am so proud of having you as my aunt. My dad would be so happy if he was there. Wish you many many more happy years in your religious life. Loads of Love from Maxim, Darryl, Dwayne and myself. Hearty Congratulation Sr Leonette on completing 50 years of service in the vineyard of the Lord as aloving NUn. I strongly feel elated because god makes great things for the very oordinary and you are one such example. May God Bless you with good help and happiness in your coming days and years. Congratulations Sr. Leonette completing 50 years of religious life in the Apostolic Carmel congregation. Wish you good health and happiness all the time! Best wishes; I do recall her decision to join the AC congregation.